Thanksgiving is around the corner. To thank all players' continuous support and love, League of Angels II will hold a series of Thanksgiving events in game from Nov. 15th to Nov. 22nd. From Nov. 15th to 19th, stylish new Clothing Pirate Captain and many other clothing will be available in Thanksgiving Party. From Nov. 20th to Nov. 22nd, Thanksgiving Chests, the special new chests for Thanksgiving, will bring you rare items and surprises. What more, there will be many special offers, discounts and bonus events. Deal (383%+14300) DMG to 3 random enemies; apply a debuff on targets hit that reduces their natural regen by 12% and increases their damage taken by 10%, lasts for 1 round (this effect ignores immunities). Deal (331%+12340) DMG to a single enemy with a 50% chance to reduce target's ATK by 12% (this effect ignores immunities). This skill always Crits, and replaces the basic attack. Clothing Pirate Captain will shows up during Thanksgiving Party from Nov. 15th to Nov. 19th. Many other clothing will also be available then. Pine Cone and Roast Turkey are special tokens for Thanksgiving. Don't forget to collect as many tokens as you can to exchange for your favorite clothing. Please note that these tokens will only be available in hot event this time. There are two Thanksgiving Chests, namely Large Maple Chest and Small Maple Chest. The chests contains many items and players can randomly get 2 of the items. And there are chances to get another chest. Thanksgiving Chests will be available in hot events from Nov. 20th to Nov. 22nd. Players can get the chest by fulfilling the requirements. Here are the details of the chest. Except for Thanksgiving Chests, many other bonus events will also been issued in game. Check out the time and don’t miss them! Nov. 21st, Free Gifts Giveaway. Come and join us in Thanksgiving events in League of Angels II! You can get the new clothing Pirate Captain and many other items at great discounts! Stay tuned for more contents and have a great time playing LOA II! Last：Black Friday Special: Enjoy the Brand-new Event and Get the Best Deal! 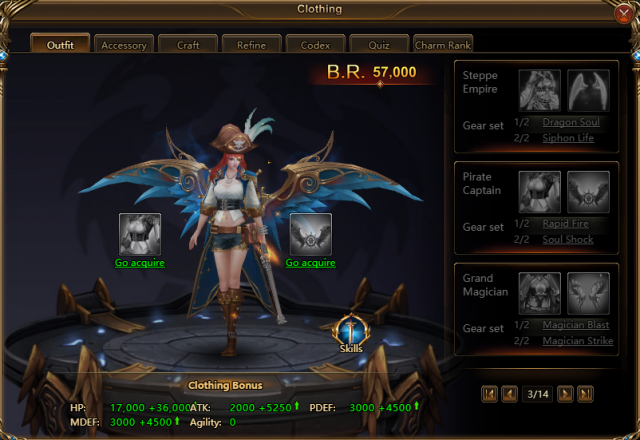 Next：New Artifact Angel Raven: Feel the Magic of Life Steal!